For information about Soukoban in general, see Category:Soukoban. 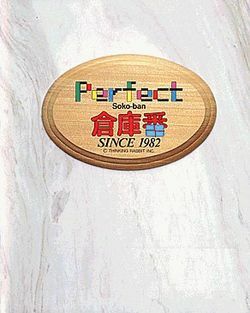 As Soukoban was being introduced to several popular home consoles in Japan, and around the world, Thinking Rabbit decided to release a "perfect" collection of the best Soukoban puzzles ever designed, and released the package under the title Soukoban Perfect in 1989 for several popular Japanese home computers. It contain 306 puzzles in all. Many of the puzzles presented in this version of Soukoban were used as the basis for the Game Boy conversions of Soukoban and Soukoban 2 (released in the United States as Boxxle and Boxxle II). This page was last edited on 28 June 2012, at 09:18.